Direct and thermal transfer labeller, for industrial applications. Simple and quick substitution of the roll. 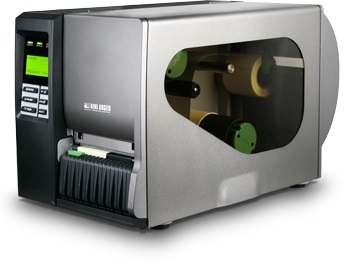 Direct and thermal transfer labeller, connectable to 3590, CPW, and TRS indicators. The quick emission of labels, the high printing resolution and the compact size make it suitable for printing in any industrial environment. CE-M approvable. PRINT METHOD: direct and thermal transfer. PRINT SPEED: up to 200 mm/s. PRINT MODE: dispensing or strip form. LABEL LENGTH: from 5 mm up to 2286 mm. LABEL WIDTH: from 25,4 mm up to 118 mm. ROLL SIZE: external diameter up to 208.3 mm. THERMAL RIBBON: internal diameter of 25,4 mm, length of 600 metres, width from 25,4 mm up to 114,3 mm. USER DISPLAY: backlit graphic LCD, 128x64 pixel, for message indication. MEDIA TYPES: die cut labels, tags and continuous strips. - 1D BARCODE: Code 39, 93, 128UCC, 128 subset A.B.C, Codabar, Interleave 2/5, EAN-8, EAN-13, EAN-128, UPC-A, UPC-E, EAN e UPC 2(5), MSI, PLESSEY, POSTNET, China POST, GS1 Databar, Logmars. - 2D BARCODE: PDF-714, Maxicode, DataMatrix, QR code, Aztech. INTERFACES: RS232C (from 2400 to 115200bps), Centronics (SPP mode), or USB 2.0 client. SIZE: 270 x 308 x 505 mm (wxhxl). POWER SUPPLY: 115/230 Vac, 50/60 Hz. OPERATING TEMPERATURE: from +5°C to +40°C. OPERATING HUMIDITY: from 20% to 85%, non condensing. Peel-off kit, with internal automatic rewind. SMTPLUSPRO Thermal transfer or direct termal labeller. Peel-off kit in option. 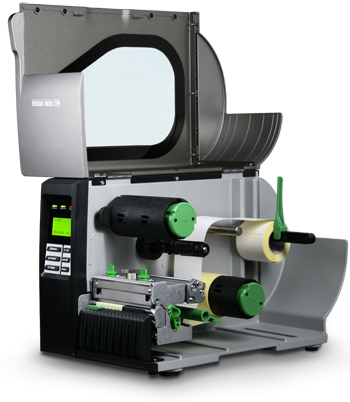 SMTRPK (S1) Label peel-off and rewind kit for SMTPLUS labeller. ET54T Roll of 1000 adhesive thermal labels l=54mm, h=66mm. 40.8mm hole, 120mm external diameter. ET54TC 20 rolls of 1000 adhesive thermal labels l=54mm, h=66mm. 40.8mm hole, 120mm external diameter. ET58T Roll of 1000 adhesive thermal labels l=58mm, h=53mm. 39.5mm hole, 110mm external diameter. ET58TC 24 rolls of 1000 adhesive thermal labels l=58mm, h=53mm. 39.5mm hole, 110mm external diameter. ET638T500 Roll of 500 adhesive thermal labels l=63,5mm, h=80mm. 40.8mm hole, 100mm external diameter. ET638T500C 36 rolls of 500 adhesive thermal labels l=63,5 mm, h=80mm. 40.8mm hole, 100mm external diameter. ET104T Roll of 1000 adhesive thermal labels l=100mm, h=40mm. 40.8mm hole, 100mm external diameter. ET104TC 16 rolls of 1000 adhesive thermal labels l=100mm, h=40mm. 40.8mm hole, 100mm external diameter. ET106T Roll of 1000 adhesive thermal labels l=100mm, h=60mm. 40.8mm hole, 115mm external diameter. ET106TC 12 rolls of 1000 adhesive thermal labels l= 100mm, h= 60mm. 40.8mm hole, 115mm external diameter. ET106N Roll of 450 adhesive TRANSFER labels l=100mm, h=60mm. 45mm hole, 90mm external diameter. ET1012T Roll of 250 adhesive thermal labels l=100mm, h=120mm. 40.8mm hole, 90mm external diameter. ET1012TC 20 rolls of 250 adhesive thermal labels l=100mm, h=120mm. 40.8mm hole, 90mm external diameter. FL110SMT Black pigmented ribbon for SMTPLUS and LP542TT 110mm x 210m.